Keeping your home raccoon-free can be difficult. These critters have become dependent on rifling through our garbage cans for food, which brings them way too close to our homes and families. We always recommend calling on professional assistance when dealing with a raccoon problem, but there are things you can do to help keep the furry bandits at a safe distance. The following are some tips we recommend for getting rid of raccoons. Raccoons rely on their ability to hide in the shadows, and are most active in the evenings or at night. A simple motion-activated spotlight or porch light left on at night goes a long way towards discouraging their activity. 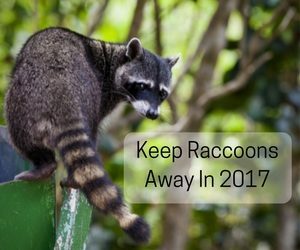 If your raccoon problems persist after giving our tips a try, don’t hesitate to call for expert help. Our technicians are highly trained and certified and are able to remove wild animals safely and effectively while keeping you and your family out of harm’s way. Call us to schedule your free home consultation today!